‘The Pale Blue Dot’ is one of the most famous pictures in astronomy. It was taken by the Voyager 1 space probe on February 14, 1990 at a record distance of about 6 billion kilometres just as the satellite left the solar system on its way towards deep space. 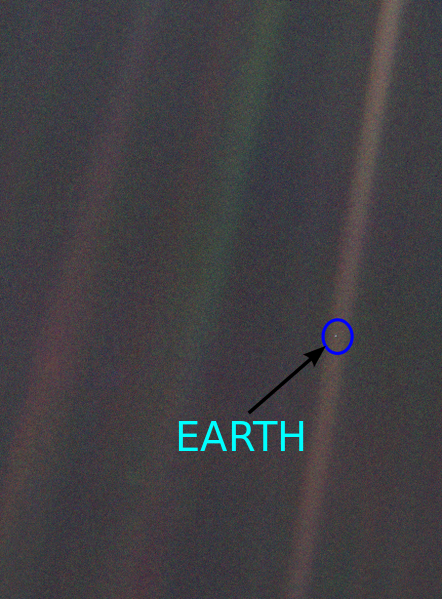 Carl Sagan expressed his thoughts on the deeper meaning of the image in his 1994 book, Pale Blue Dot: A Vision of the Human Future in Space, where he calls for a greater understanding and responsibility to deal more kindly with one another and to preserve and cherish the pale blue dot, the only home we’ve ever known. I believe that with greater understanding and knowledge we as a species can learn to live with the natural forces that shape the Earth.